Back in 1971 I almost bought a Honda S800. 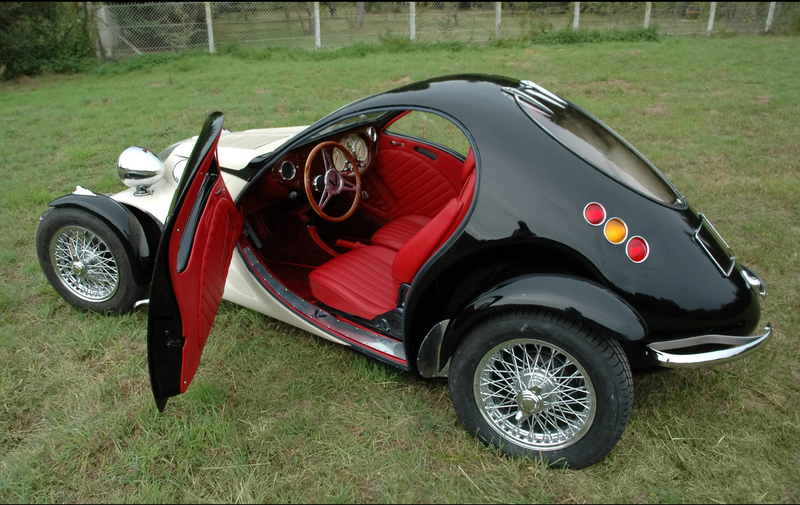 A fabulous little two seater sports car featuring a 791cc in line four cylinder engine with four carburettors powering a live rear axle that was nicely located by four radius rods and a Panhard rod. They were a gorgeous little car but production ended in 1970 and I finished up, probably sensibly, buying a Datsun 1600 (aka Datsun 510). The reason I start with that short anecdote is because there is a new car from a new company that is moving towards production that reminds me of the Honda S800 except that it is like a cross between the Honda S800 and the Bugatti Aerolithe; it’s small, it’s drop dead gorgeous, and it should be a wonderfully lively small sports coupé. 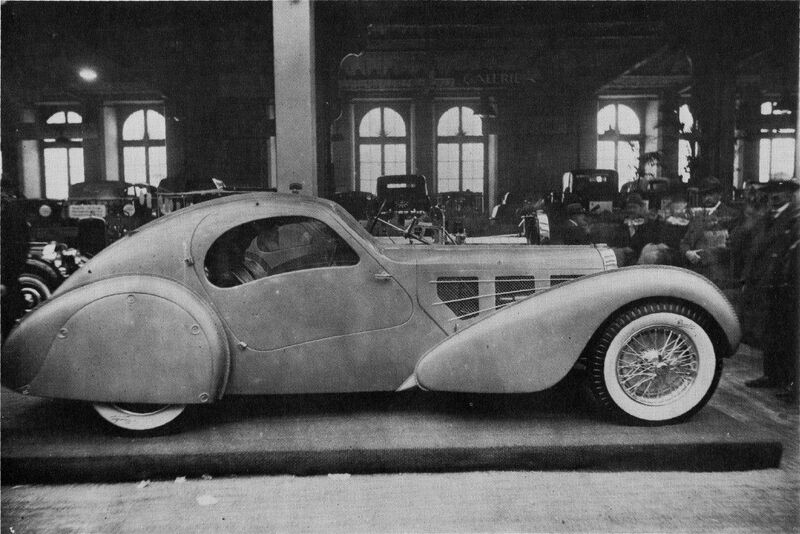 4 Stroke is a new boutique car maker created by Roumen Antonov who loved the Bugatti Type 57, of which the Aerolithe is arguably the most beautiful. He began creating his design concept in the early seventies, (the same time I almost bought the Honda). After his escape from then communist Bulgaria Roumen Antonov worked on design and development of automatic transmissions and is credited with the design of a DSG (Direct Shift Gearbox) . In 1998 Antonov managed to set up a workshop in Le Mesnil-Amelot, which is not far from Paris’s Charles de Gaulle airport and created the company “4 Stroke”. He managed to display his prototype car at the 2002 Paris Motor Show which garnered much interest and since then his company has been working to get the car to production stage. The cockpit of the 4 Stroke Rumen is a clever mixing of thirties style and 21st Century comforts, including air-conditioning. 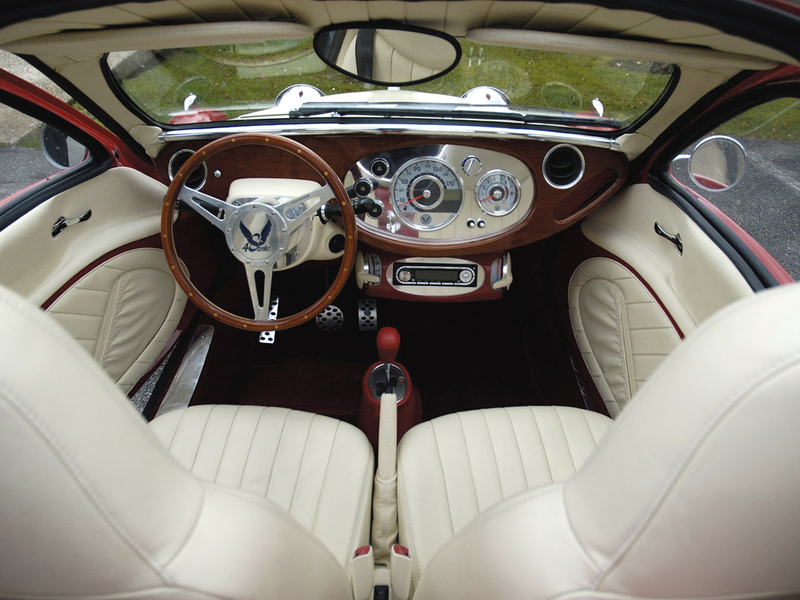 The steering wheel is a delightful alloy and wood creation. (Picture courtesy autowp.ru). The 4 Stroke Rumen has a carbon fibre composite body built onto a steel frame. The engine is a three cylinder in-line unit driving the rear wheels. Why a three cylinder you may ask? In order to be fully balanced a four stroke engine needs three cylinders or multiples of three. Hence a six cylinder engine will sound smooth whilst a V8 has that characteristically uneven note about it that we all love. Try listening to a Triumph Trident motor cycle and you’ll hear what I mean. So the turbocharged three cylinder 998cc engine used in the 4 Stroke Rumen will have a smooth and balanced sound and feel about it. The 4 Stroke Rumen has an aerodynamic profile despite its thirties styling. (Picture courtesy autowp.ru). The transmission of the 4 Stroke Rumen is a five speed sequential semi-automatic gearbox. The independent suspension of the car is complimented by ABS and stability control. It is very 21st Century. Technical details listed on the German Wikipedia page are as follows. 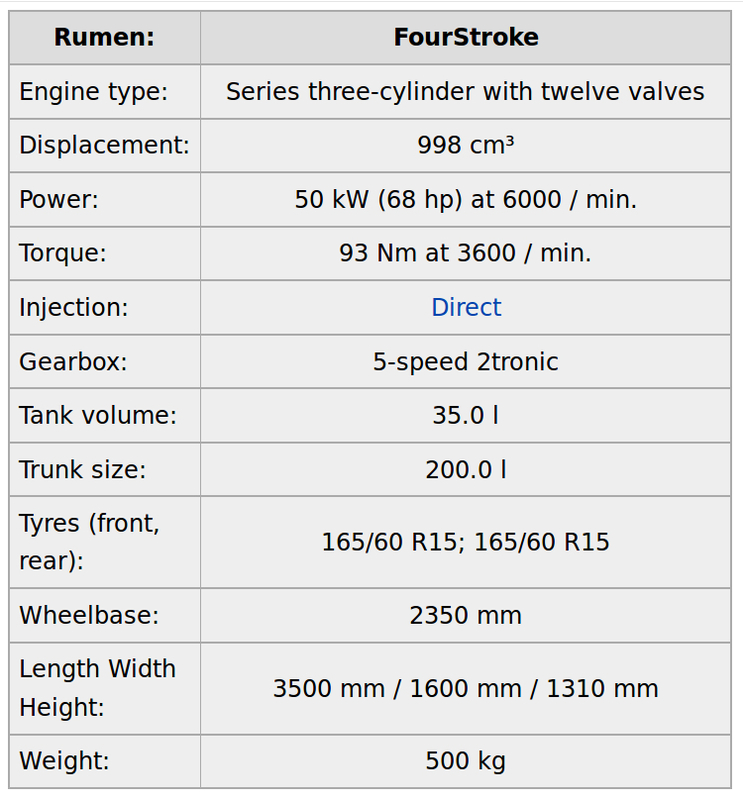 Technical specifications of the 4 Stroke Rumen. (Courtesy Wikipedia.de and Google Translate). 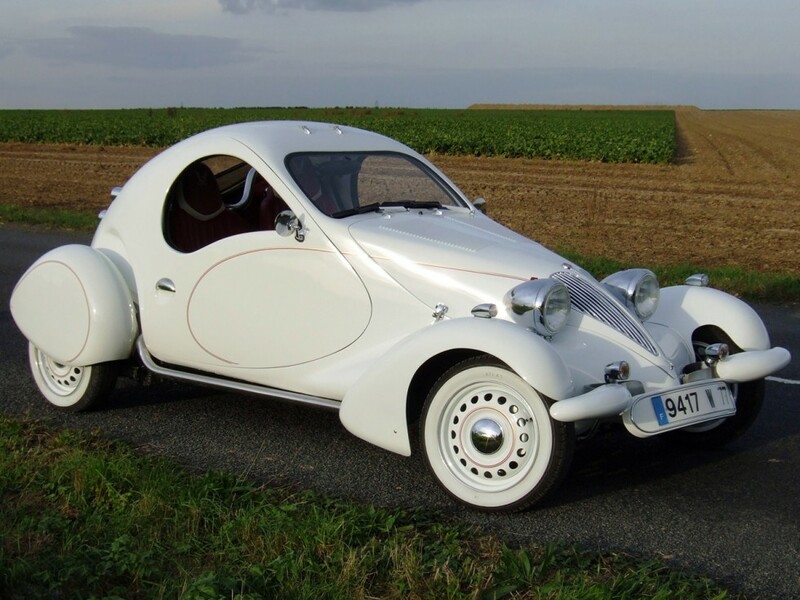 This is an interesting car that has been in development for some years. Will it actually enter small scale production? Time will tell. It is such an interesting concept I hope it does. 4 Stroke say they plan to market the car in the UK and USA. For a car such as this one I think Japan may well be a market that would work also, especially given the car’s small size and that the car is set to be given a Toyota Aygo engine. 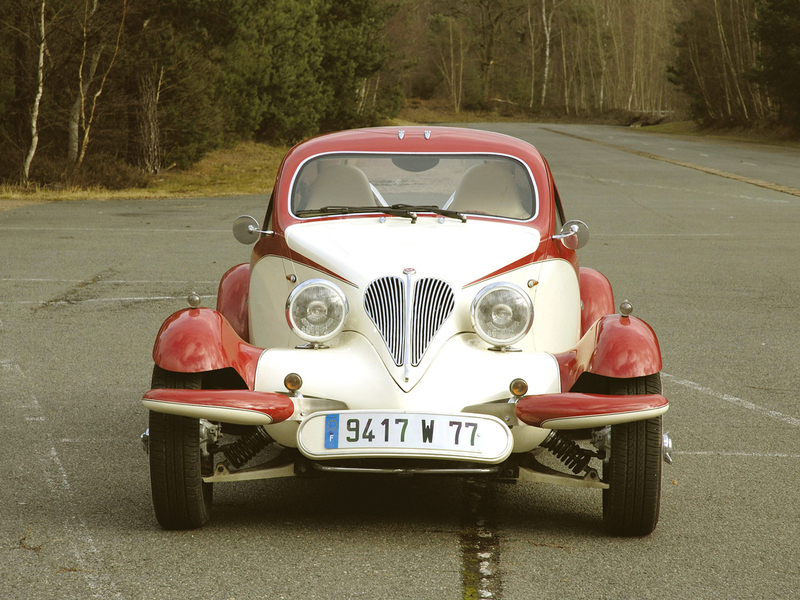 If you are interested in further information on this car you can contact 4stroke-design.com if you click here. Price point is expected to be around €55,000 so this is not a cheap small car, and there are lots of very desirable cars one can buy for USD$70,000.00. 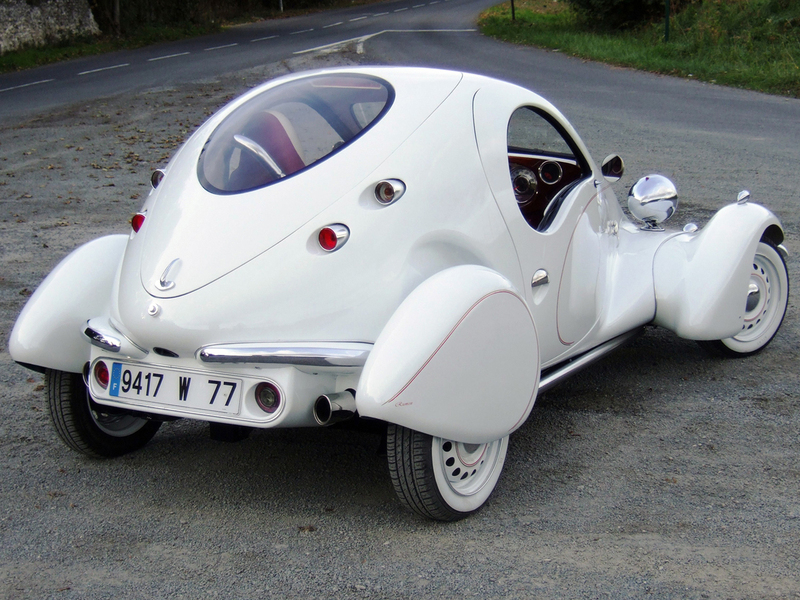 Small, lively, it can’t help but be economical and therefore seen as “environmentally friendly”. 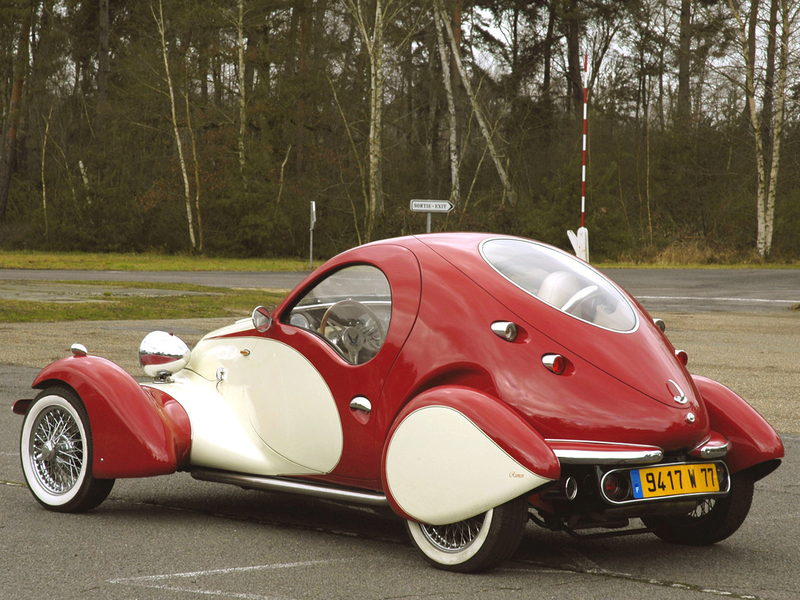 So this is a car that could create a trend. Time will tell.